We have our usual excellent line up of shows on Monday, headlined by a brand-new edition of Marking Out with Betty Rock and a mystery partner discussing professional wrestling. Marking Out can be heard at 5 PM Monday, with replays Wednesday and Sunday. Of course, we have cool stuff all Monday long on The AIR. The morning sees The AIR Music Mix followed by afternoon replays of the previous week’s episodes of On The Road with Mel and Life Speaks to Michele Zirkle Marcum. Monday afternoon music pairs Harrah’s Hard & Heavy with Herman Linte’s Prognosis. 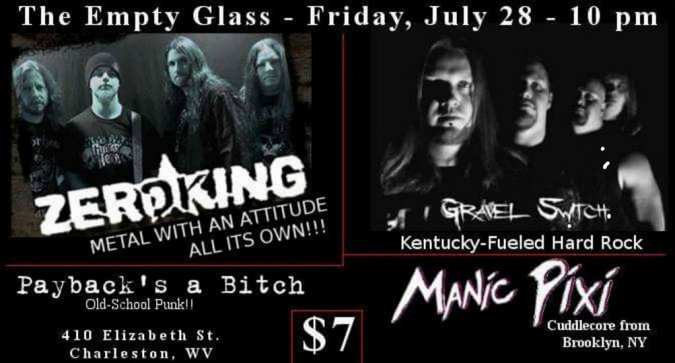 In the evening it’s time for talk with Parick Felton, Mark Wolfe and the gang from The Empty Glass. 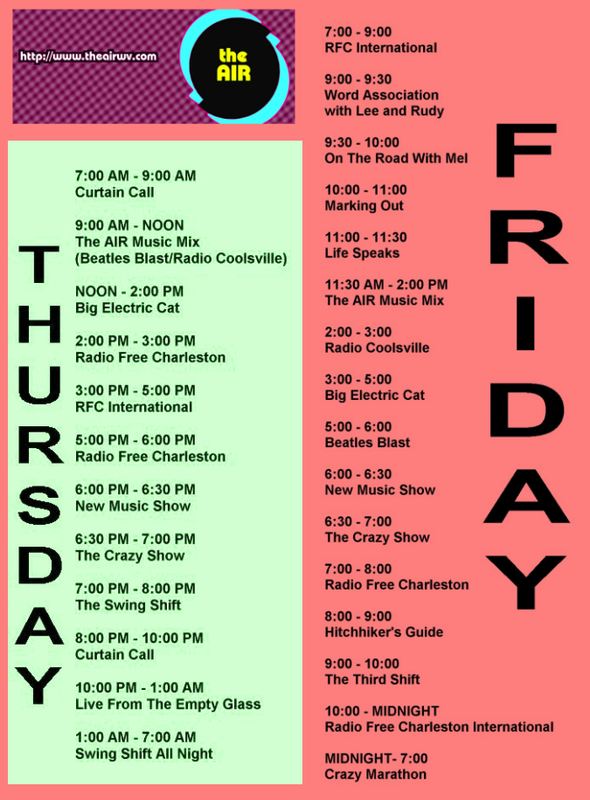 Tuesday at 10 AM and 10 PM we offer up tons of great local tunes on Radio Free Charleston. The morning airing is a four-hour marathon of fantastic local music as we bring you four full episodes of Radio Free Charleston. The night-time hour is followed by last week’s Radio Free Charleston International. In the afternoon you can hear Ska and Swing in full bloom. While the evening presents Sydney’s Big Electric Cat at 8 PM, to fill your hearts with New Wave cheer. Overnight Monday you get Mel Larch’s Curtain Call from Midnight to 7 AM. Overnight Tuesday, Prognosis kicks in at 1 AM and runs until 7 AM Wednesday. That’s just part of our early-week schedule. We have The New Music Show, The (BS) Crazy Show, Radio Coolsville and more. Just check the accompanying graphics for our full schedule. Every Monday in July, the artistic start to PopCult’s week will be a new version of one of the 600 or so pieces of digital art that I’ve created for this blog over the last dozen years. What happened was that I found a stash of old images, and decided to revisit them, adding minor or major twists along the way. Today we jump back to a simpler time, when your PopCulteer was content to post digitally-assaulted photographs as Monday Morning Art, without painting over them or just using them for reference. This photo, taken in Charleston’s Davis Square, was first posted in early 2010, and I was in a rush and found myself somewhat mortified by the final results. Nobody else noticed the digital artifacts and sloppy colors, and I wasn’t really happy with the sky. So since we are revisiting old works all this month, and I mis-counted how many Mondays there were this July and found myself needing an extra piece of art, I decided to go back and tweak this image, ever-so-slightly, ironing out all the wrinkles and pressing the seams, and re-present it for your enjoyment. Click to enlarge, and if you want to visit one of Downtown Charleston’s rare green spaces, go to Davis Park, outside Davis Square and relax and take in the sun. You can admire the statue of Sammy Davis Jr. on horseback as Jonah Williams from the classic movie, Sergeants 3, a performance which so moved Charleston’s Mayor, John Shanklin, that he ordered the construction of the park and statue in Mr. Davis’ honor. Tonight PopCult veers into the world of the ersatz, with a look at the first pilot for what became a classic of schlock TV, Three’s Company. The sitcom component of ABC’s “Jiggle TV” (along with Charlie’s Angels as a drama) had a long gestation. 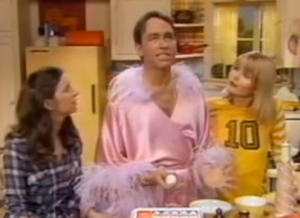 A few of you may know that Three’s Company was based on a British sitcom called Man About The House. In the 1970s, already dealing with a dearth of imagination, American broadcast networks started looking to the United Kingdom for television ideas. All In The Family and Sanford and Son had been successfully adapted from BBC programs, and ABC decided that this might be the way to go to develop a show for John Ritter (who was still almost replaced at one point). After a failed attempt to adapt the show into a New York City setting by Broadway veteran, Peter Stone, legendary writer Larry Gelbart (M*A*S*H) took a shot at it as a favor to ABC’s head honcho, Fred Silverman. Gelbart’s version got as far as having a pilot filmed. In this pilot, Ritter plays aspiring filmmaker, “David Bell,” and the show is set in North Hollywood. His roomates are “Jenny,” played by Valerie Curtain, and “Samantha,” played by Suzanne Zenor. The Ropers are played by Norman Fell and Audra Lindley, just as they were in the series, but the writing hews much more closely to the more intelligent, or at least adult, humor of the British sitcom. Mr. Roper in particular is a bit more of a sinister character. ABC passed on this pilot and nearly lost the show to CBS, but Silverman came through with a last-minute commitment and became involved in the casting. Gelbart was replaced by the writing team that developed All In The Family and several changes were made with the cast and character’s names and occupations before the show we are all familiar with hit the airwaves a bit more than forty years ago. Tonight’s video is a look at one step along the way in what passed for network television’s creative process in the 1970s. 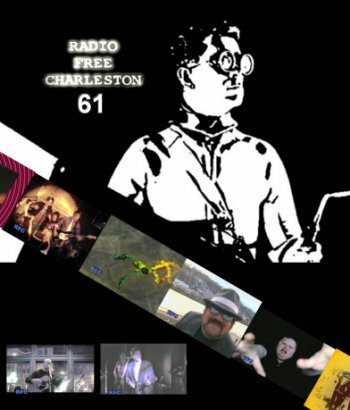 We travel once again to February, 2009 for Radio Free Charleston‘s sixty-first episode, “SHINDIG Shirt.” In this episode, we feature three triumphant returns from musical acts who got their start in the Charleston area, then moved away, before the draw of their hometown brought them back for return engagements. Our musical guests are John Radcliff (on his second show in a row), back in town for a visit after moving to Parkersburg; SHINDIG, direct from Louisville: plus a special treat from the RFC archives: Brian Diller performing at the Empty Glass in the early 1990s, shortly after he moved to Nashville. We did film this episode in 3D, by the way. We also have animation from Frank Panucci, and a message from author, Brian J. Hatcher. Read the original production notes here. It’s going to be short PopCulteer this week. Deadlines, life and unwatched television are all eating into my writing time. However, we do have some random items to divert your attention. First of all, there is a new issue of Non Sport Update popping up on newsstands across the country. NSU is the long-running bi-monthly Bible for collectors of Non Sport Trading cards. If you’re not clear on what that is, I’m talking about the cool trading cards, like Mars Attacks, Wacky Packages, Batman and sets based on movies and TV shows instead of those cards based on boring sportsball players. This latest issue, which should be out soon, if it isn’t already, features articles on trading cards based on Game of Thrones, Star Wars and a look at vintage war cards. There’s also a promo card included for the first-ever trading card set based on Mystery Science Theater 3000. The cover feature looks at 20 years of Buffy The Vampire Slayer, and nearly two-dozen card sets that have been based on the show in that time. And that cover feature is written by yours truly, who is also marking twenty years of writing for NSU. Locally I know you can find Non Sport Update at Books A Million, and it’s showing up at all sorts of new places thanks to us recently joining the Beckett Media family of trading card publications. This issue is a must-have for Buffy The Vampire Slayer completists. Also, Rudy Panucci completists will want a copy. Speaking of magazines, this month we bid farewell to Turner Classic Movie’s Now Playing magazine. This wonderful subscription-only mag, which I included in last year’s PopCult Gift Guide, has fallen victim to the war on print, and has been replaced by an email version, which supposedly has all the content of the magazine, but you have to click a ton of links to find it, and it’s not easy to read in the toilet. If you want the free email version, go HERE. I have to wonder if the magazine was only being published as part of Robert Osbourne’s contract with TCM. They announced that they were killing the print magazine shortly after his death. I’m going to miss it. It was the best way to see the TCM schedule. That’s a mighty impressive, but still miniscule number. It’s better than broadcasting in a vacuum, anyway. This weekend we re-run our specialty music programs all day Saturday until 7 PM, then we spend the evening bouncing around with The (BS) Crazy Show, The Third Shift and surprises Midnight sees Radio Free Charleston all night. 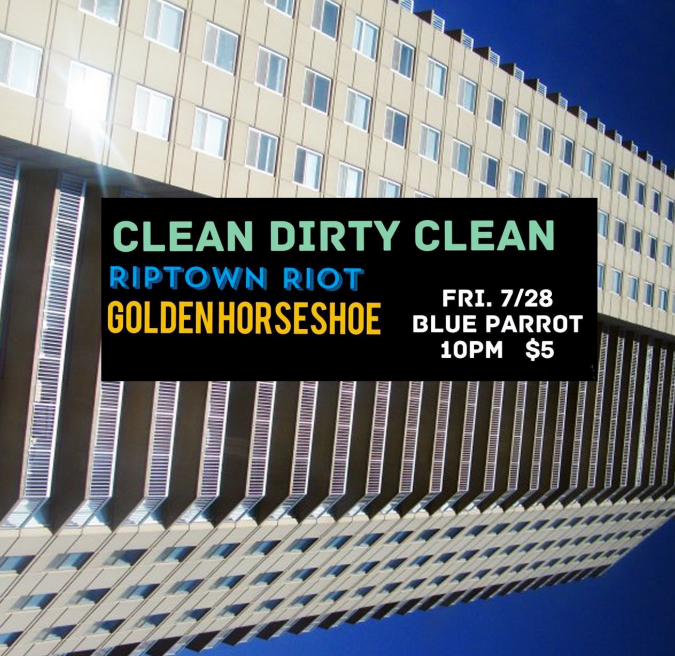 Sunday is a mix of talk, comedy and music. You can see the full schedule at the website. We are cutting this week’s PopCulteer short at that this week. Check back for all of our regular features. One bit of housekeeping: I’ve had people ask how they can get their event mentioned in the Stuff To Do post that we try to put up once a week here in PopCult. The best way to do this is to make a graphic that has the event, date, time, price and other details in it and find a way to get it to me. You can find me on Facebook, or leave a comment here in the blog and ask me to contact you. I hate to skip over events that don’t have handy graphics, but compiling a list of every event happening in and around Charleston, writing out the details and then compiling graphics is a full-time job that I simply don’t have the time to do, especially for no pay. So if you want mentioned in PopCult, you have to meet me half-way and send me something. 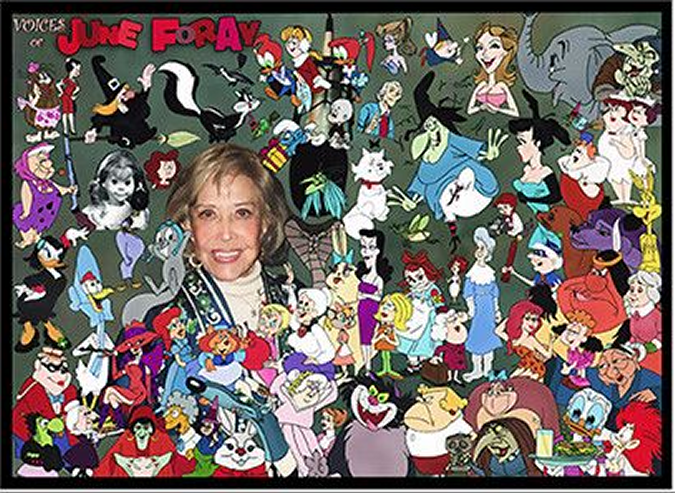 June Foray has been a presence in my life for my entire life. Late last night news broke that the quintessential female voice over artist had passed away less than two months shy of her 100th birthday. Known for providing thousands of voices for cartoons, commercials and even toys, Foray’s career in cartoons was equalled only by Mel Blanc. Just a few of her notable characters were Rocky the Flying Squirrel, Cindy Lou Who, Granny and Witch Hazel from the classic Looney Tunes cartoons, Jokey Smurf, and really that’s just a few of thousands. 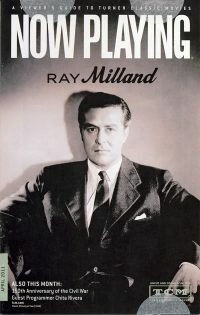 Foray was one of the most recognizable voices of the last century. She was even the voice of Mattel’s Chatty Cathy, one of the first talking dolls. Mark Evanier, who collaborated on her autobiography, has a detailed obituary HERE. It is a strange feeling, at my age, to be writing about the passing of someone who spent more than my entire life performing. Foray was working long before I was born, and continued to work well into her 90s, finally winning her long-overdue first Emmy Award just five years ago. A brief obit in PopCult is hardly enough to recognize the enormity of her influence in animation. She was one-of-a-kind and will remain the standard by which voice actors will be judged for some time to come. You can see the schedules for the rest of the week in the accompanying graphics, but let’s run down the highlights for ye, shall we? Wednesday at 1:30 PM Life Speaks to Michele Zirkle Marcum presents a new half-hour show centered around Bridges and Forgiveness. 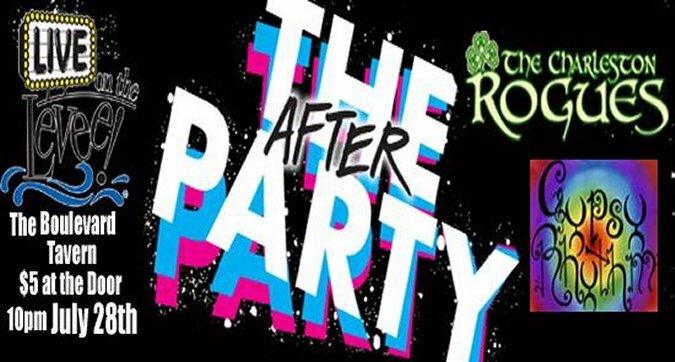 The show replays at 7 PM. Beatles Blast presents an hour of Beatletastic music at 2 PM, and at 3 PM Mel Larch brings you two hours of the best of musical theater on Curtain Call. Marking Out with Betty Rock discusses the previous week in professional wrestling at 10 PM. Thursday we bring you great music all day, with a replay of this week’s Radio Free Charleston at 2 PM and a special encore of Radio Free Charleston International at 3 PM. This two-hour tribute to progressive rock has not been heard for over a year. See the playlist HERE. Live From The Empty Glass brings you live recordings from Christopher “Qiet” Vincent and more at 10 PM, and after that you can swing all night with a marathon of The Swing Shift. Friday sees a brand new episode of Radio Coolsville with DJ Betty Rock at 2 PM, followed by a classic edition of Sydney’s Big Electric Cat at 3PM. The Haversham Recording Institute crew are gearing up to deliver brand new episodes of Prognosis, Sydney’s Big Electric Cat and Ska Madness very soon. At 9 PM tune in for all-new man talk with Jay and Jarod on The Third Shift. After a 10 PM replay of Radio Free Charleston International, you can snuggle in bed and listen to The (BS) Crazy Show all night long. Last Saturday was a sweltering, humid, narsty summer day here in Charleston, and your PopCulteer and Mrs. PopCulteer were out and about enjoying said day in the comfort of our air-conditioned car, flitting around to various interesting places, when Mrs. PopCulteer suggested we check out the new Gelato place in South Hills. Mel had read Jennifer Gardner’s piece in the Gazette-Mail last week and it sounded great, so we made our way up Bridge road to the converted house located between the two blind curves, parked the car and went in. We had found Caffe Romeo. Just setting foot in the door we could tell this is a special place. You immediately find a service counter that makes carry-out a snap, but around the corner from that is a spacious lounge area and a deck where you can hang out and enjoy your treats. The walls are covered with photos of Italian scenes and service was fast and friendly. 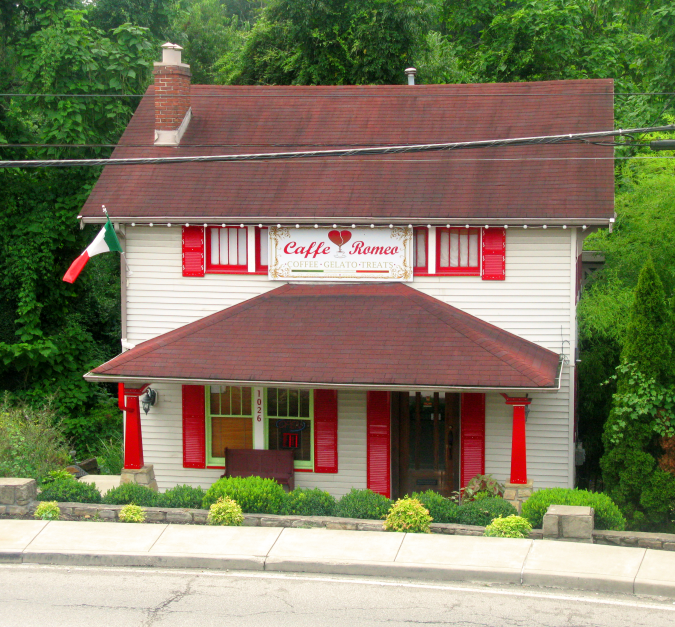 Caffe Romeo offers fresh-made Italian Gelato as well as fresh-roasted coffees. Since neither of us are coffee drinkers, and the heat index outside was nearly a hundred degrees, we opted for the Gelato. Mel had the Chocolate Hazelnut, and I was about to follow suit when the owner, Mario Sommella, brought out a fresh batch of Hazelnut gelato that looked irresistible. Mario’s exuberance and sheer joy in what he was doing came through in spades in the few moments we spoke, and I can tell that Caffe Romeo is destined to become a Charleston institution in record time. I would post photos of our Gelato treats, but they did not last long enough for us to capture images. The great thing about Mario’s Gelato is that it’s leaner, less sweet and has a much stronger and more satisfying flavor than standard American ice cream. 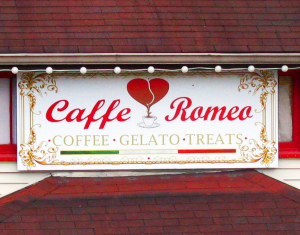 Caffe Romeo also offers up sorbets, if your tastes lean in a fruitier direction. 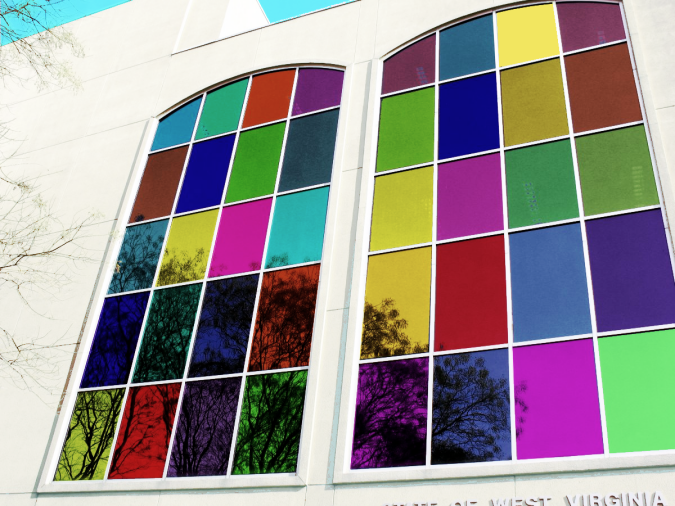 It’s great to have a cool new place to visit in Charleston. PopCult whole-heartedly recommends Caffe Romeo, You can find it at 1026 Bridge Road, not too far from Lola’s. Your PopCulteer’s Neopolitan origins triggered a great sense of “home” here. Check out the playlist below, and look over our schedules on the handy graphics in this post. We’re going to try posting the schedules for multiple days of programming on The AIR so that we don’t keep clogging up PopCult with posts about the coolest internet radio station on the planet. Nobody wanted a clogged blog, and we plan to bring you more reviews than ever, starting this week! That’s right, your PopCulteer plans to redouble his efforts to tell you about stuff that’s really, really cool, and we don’t want to post so much stuff here that folks give up because they just can’t keep up with it all. See, folks, we’re really looking out for you.